Introducing the all-new Foster ice machine! For the last 70 years we have maintained our record of manufacturing the strongest walk in coolers by using the heaviest metal and 26-gauge galvanized steel sheets. Our panels are also manufactured with an attractive corrugated finish for added strength. Unlike the nominal dimensions used by most manufacturers, our walk-ins are full dimension. Our 8’x10’ walk-in is a full 8'x10'. Our walk-in heights are 8'2" with a floor, and 7'10" without. Door openings are standard 34.5" with many custom options available, including 58" pallet-size doors. Most companies still place small pieces of wood and plywood inside the door and door frame for various purposes. In a permanently moist environment, deterioration, bending, and expansion of wood occurs after some time, requiring doors to be replaced every few years. Foster resolved this problem 35 years ago by eliminating all uses of wood. With the lowest k-factor and the highest R-value, Polyurethane foam provides more thermal resistance than any other insulation material on earth and is used by NASA to insulate space shuttles. At Foster, we use Polyurethane to insulate our walk-in coolers and freezers, whereas most companies use polystyrene, a cheaper insulation material used in packaging and coffee cups. 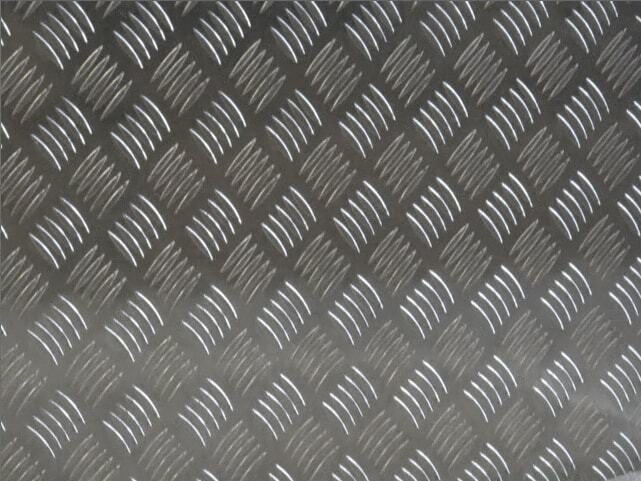 Foster uses 3/16" aluminum diamond plate for floors which is strong enough to support 750 lbs/sqft. and is corrosion resistant. When purchasing a Foster walk-in, you are dealing directly with highly qualified experts in our manufacturing facility who assist the customers at every stage, from purchase to installation. We are always happy to answer your questions. Call us at 518-671-6036 or info@fostercoolers.com. As the R-value of Polyurethane is highest compared to any other material on earth, Foster customers recover all the money invested in their walk-in unit within few years through savings in electricity. Foster customers are buying very high end walk-in coolers made of Polyurethane and galvanized painted steel, but paying as little as they would for a walk-in cooler made from cheaper Polystyrene and Galvalume. Walk-in coolers are normally shipped from Foster's factory within five days after the confirmation of an order. Special orders may take longer to ship. 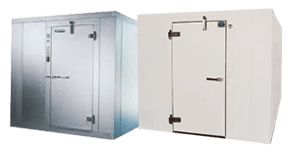 Our walk-In units come with a 15 year warranty on panels against any manufacturing defects, and a standard one year warranty on all the refrigeration components. You can also purchase a five year extended warranty on compressors (US only). 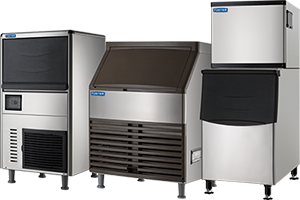 Give us your requirements and we’ll give you the perfect cooler or freezer. Wall, ceiling and floor panels are of varying widths and are interchangeable with like panels. Corner panels are a combined male/female pair with 1' exterior horizontal measurement. Height of a walk-in cooler with 4" floor is 8'2" and without floor (using screed) is 7'10". Panels are made of foamed-in-place Polyurethane insulation, sandwiched between interior and exterior metal skins which is die formed and gauged for uniformity in size. All panels are built to NSF specifications. Floors are designed to readily withstand a uniformly distributed load of 750 lb per sq ft. In case no floor is required, then a 4" high vinyl screed is provided. The screed is coved on both sides and sits flat on the floor. Screeds are nailed or screwed to the floor through the center during assembling. 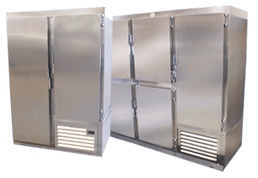 Foster Refrigerators is the only company in the USA that is using 120-micron polyester paint on galvanized steel sheets.120-micron polyester paint is electro-statically applied on 24-gauge sheets and then baked at 400F. This process insures that Foster panels have a life 10 times longer than those of any other manufacturer in the USA. This process also gives an elegant texture to the walk-in cooler. Locking devices consist of plastic cam locks that are foamed in place and are attached to the interior skins of the panels. These locking devices are not floating in urethane, unlike those found in the rest of the industry, but are permanently fixed to the skin. Cam locks can be moved by a hex wrench, which is provided by Foster. Access holes for locking devices are on the interior sides of the panels to allow easy assembly of the walk-in coolers from the inside. Access holes for locking devices are covered by snap caps. To keep the cooler airtight and dust proof, PVC gaskets are foamed in place to the male sides of the panels, on both the interior and the exterior. The door is has a posi-steel door closure and latch. Two strap-type cam-lift hinges are provided. An isolated, low wattage heater strip covered by magnetic stainless steel is fitted onto the jamb in freezers. This strip proves to be the perfect sealing of the magnetic gasket and prevents frost and condensation build-up. Concealed wiring is standard on each entrance door. A threshold with non-skid striping is provided with each door section. The heater wire continues beneath the threshold in the freezer. A digital thermometer is included in the door frame to indicate the inside temperature.